Legacy & Lineage is a course designed by international author and performance poet TS Hawkins. The goal of the course is to have high school students blueprint their imprint with pride by paying homage to classic literary works to quill their own legacy. Using poetry as a vessel to catapult truth, the students utilized styles such as anaphora, haiku, tanka, villanelle and verse while merging lines from classic literary works to help pen their stories. Being influenced by the works of William Shakespeare, Alice Walker, Edgar Allan Poe, Lois Lowry, Tony Kushner, Jeanine Tesori, Maya Angelou, Paula S. Rothenberg and John Colapinto, just to name a few, students learned how to move language from the page to the stage; pushing themselves out of their comfort zone to cultivate a unique voice plus hone proficient skills in creative writing. “Written Alive” is the culmination of the youth’s presence in print. Poems included in this publication were created solely during the Legacy & Lineage course. From class assignments to emotional free writes, the student’s selected the works that best displayed their current artistic vision. 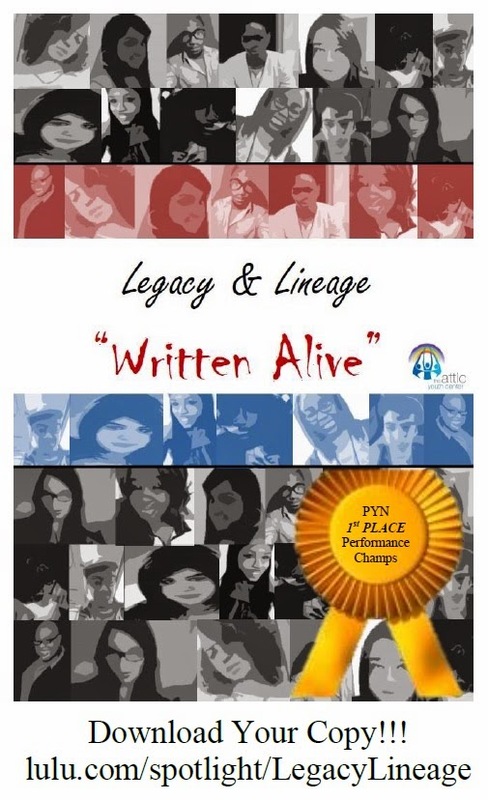 Additionally, before the publication was available to the public, the Legacy & Lineage students became 1ST PLACE ALL-CITY CHAMPIONS during the PYN Showcase!! Click the photo below to download your FREE COPY now!